Nate and I live right down the street from a little wine bar that has the most amazing food. It's on the fancier/pricer side so we don't go too often but when we do I always leave very full and wanting to step up my cooking. A couple of weeks ago was no different. Through the running club I run with, we got a discount to a beer dinner that the bar was having that included 5 beers from a new local brewery and a 5 course meal. Everything was delicious but one dish in particular was over the moon! It was a mango chutney spinach salad and goat cheese. I really couldn't get enough. After that, I decided there just wasn't enough chutney in our life. We hosted football on Sunday so I used that as an opportunity to play around with a chutney idea. After the rhubarb pizza came out so well, I decided to try chutney as the sauce for a pizza. I had peaches so I made peach chutney. I could probably eat this stuff by itself, but instead, I topped it with a little sautéed spinach, fresh peaches, bacon and goat cheese... and of course mozzarella! I got to say, I'm really loving the fruit/vinegar sauce on pizza a lot. Maybe even more than traditional pizza. It was devoured at our party too... like Nate almost didn't get any... so I'm hoping everyone loved it as much as it appeared. 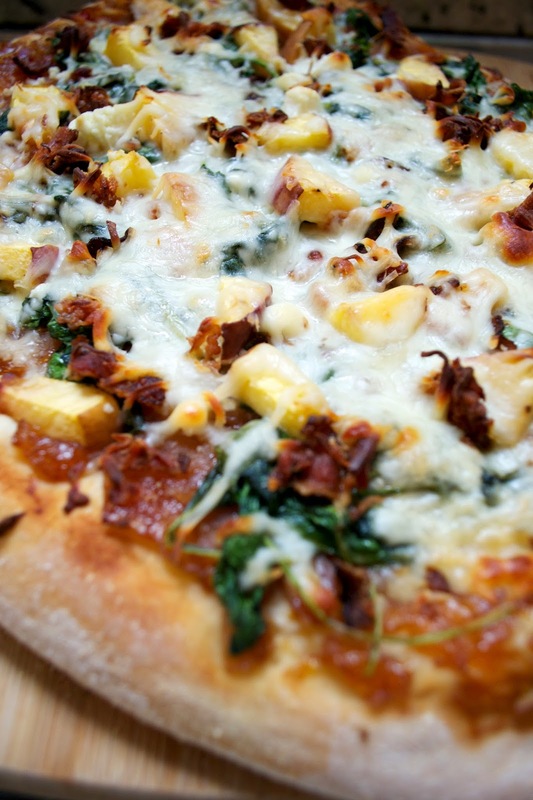 Preheat your oven to 350˚ F. Spread a thin layer of cornmeal on a cookie sheet or pizza stone. Roll out your dough and place on the cornmeal. Let it sit while you prep your toppings allowing it to rise slightly. Make your chutney next. Heat oil over medium high heat. Cook onions until soft. Add the pepper and 2 cloves of garlic and cook until the onions are browned. Add the vinegar and sugar and bring to a boil. Add salt and pepper to taste and then reduce heat. Simmer until a syrup is formed ~ 5 min. Add all but 1/4 cup of peaches to the syrup and simmer until the peaches are soft. Mash the peaches with a fork and cook for 1-2 minutes more (add water if the mixture is too thick). Remove the chutney from the heat and let cool 5-10 minutes. While the chutney is cooling, cook the bacon until crispy. Discard all but a tbsp of bacon grease. Cook the remaining clove of garlic in the bacon grease until lightly browned and then add the spinach. Sauté the spinach over low heat until slightly wilted. 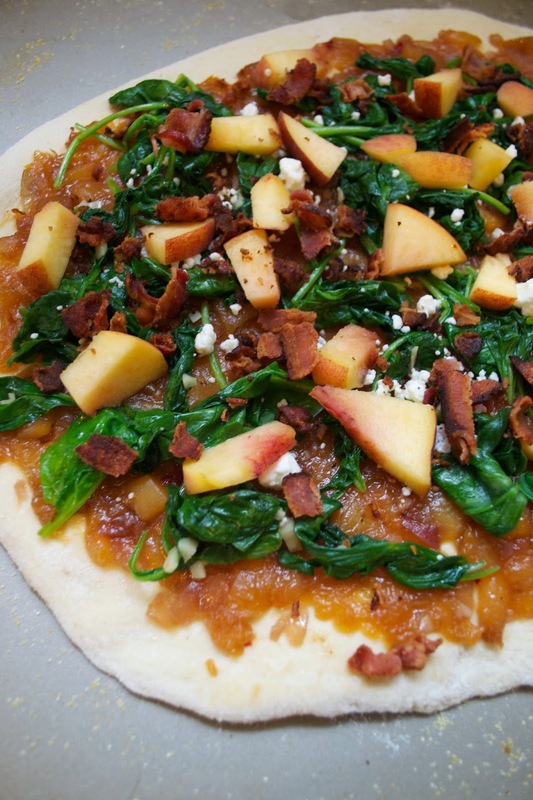 Spread the chutney over the pizza dough, and then top with the spinach and left over fresh peach chunks. Crumble the bacon and goat cheese over top and then top everything with mozzarella. Bake the pizza for 15-20 minutes until the cheese is nice and melty and slightly browned. Let cool and then cut. Try not to eat it all at once!